Smart tech, which was once the sole purview of the uber-wealthy and most technologically advanced, is now becoming standard in more and more modest homes and even apartments. As more products are offered, the price is dropping, making some key pieces of home smart tech affordable for almost everyone. In some cases, smart tech can not only increase security, but it can also significantly cut costs. This is particularly true of smart thermostats, which can help seriously reduce your energy costs. What is a “smart” thermostat? 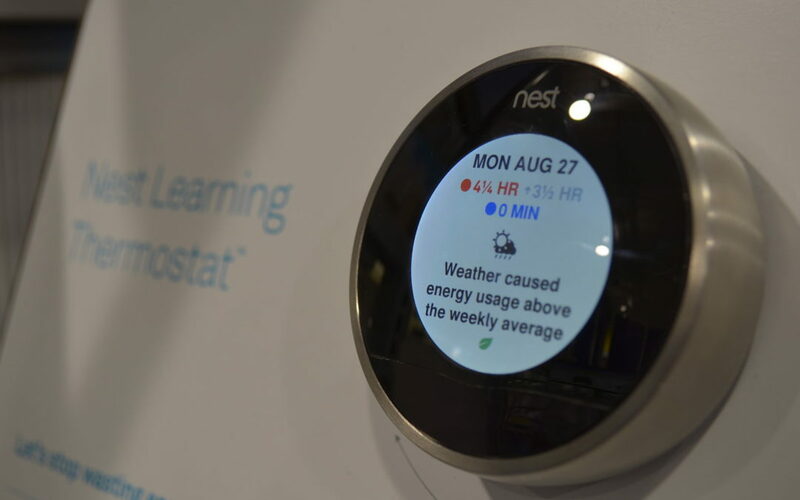 A smart thermostat, like the nest, is a thermostat which can be controlled remotely by almost any connected device, such as a home hub like the Amazon Echo, Google Home or Apple HomePod or remotely via a smartphone, laptop, desktop or tablet. A basic smart thermostat has three components. One component plugs directly into your HVAC system, which allows it to communicate with the thermostat itself, which is the second component in the system. The last component is the app, which allows you to control your thermostat from your cell phone, computer, tablet, home hub or any connected device. Some smart thermostats offer other features as well, such as models which “learn” your habits and don’t require programming, smartphone tracking which will adjust the temperature as occupants get closer to home or additional sensors which help even out temperatures across different zones in your home. How do smart thermostats help save money? One of the primary issues that many homeowners face when attempting to heat or cool their home is keeping their home a uniform temperature. Most homes have zones that are almost always too hot in the winter or too cold in the summer. This leads to an increase in energy consumption by trying to keep the overly hot areas cool or the overly cool areas warm. Some of this variance can be addressed by opening and closing vents, but older homes will often have still have trouble maintaining an even temperature. Smart thermostats often come with a number of sensors you can place in each zone to help maintain an evener temperature throughout your home while still saving on energy costs. Learning thermostats can also save you money because they turn the heat down or the AC up when you are ready for bed when you leave for work and before you return home. Many people are hesitant to turn the AC or heat too far down when they leave the house, or they return to either a blast furnace or a freezer. Smart thermostats allow you to drastically reduce or increase the temperature in your home when you are away while still returning to a nice warm or cool home when you enter. If you are ready to save some money and upgrade to the comfort and convenience of a smart thermostat, Adonai electric can help. Call an Orlando electrician today to let us help you choose the right thermostat for your needs. An electrician in Orlando Fl can help you get your smart system up and running in no time.